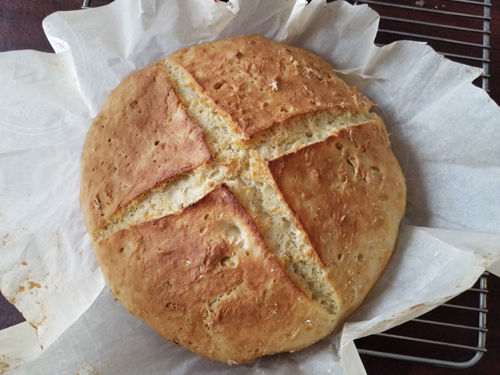 There was something wrong with my soda bread. Over the course of a week, after baking about ten loaves, it was obvious we had a problem. Not to get all technical, but it didn’t have the usual oven spring and the crumb structure was denser than it should have been. It was still delicious, but not quite right in its texture. Was it the oven temperature, the kneading, the water? Maybe I was not paying enough attention to detail. Perhaps I’d just lost my knack — or it could be something darker. I joked last year of using Lucky Charms in the recipe — and this may have stirred the fairies or little people, who in turn cursed my baking. But as it turns out, it was the baking soda. I don’t know how old a can of baking soda must be to be beyond the sell-by date, but my can was expired. Does baking soda actually go bad? Yes — and it was confirmed by a simple test I found online. A number of factors can ruin baking soda, and generally, it should be kept in a cool, dry place. The cabinet above my stove certainly gets warm — and the steam from cooking can’t be helpful. I baked a final loaf Sunday night with a newly opened container of baking soda and the results were back to normal. Mystery solved — but just in case, never take any chances with the fairies and little people.